This fun and practical ceramic pet bowl is perfect for a rabbit’s food or water. 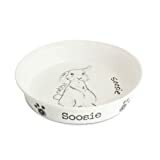 Make this bowl unique by personalising the front with your pets name upto 15 characters. The name will also feature on the inside of the bowl. Please Note personalisation needs to be entered exactly how you require, including apostrophes. 5) If you miss the Gift Box at checkout please e-mail your personalisation using the Contact Seller button next to the order details in your Amazon Account. (b) Click on the ‘My Account’ link at the right of the menu bar, you may be asked to log in at this point. (c) In the orders Section under the ‘More Orders Action’ heading there is a link ”View Your E-mails With Sellers”, clicking on this will take you to the message centre.